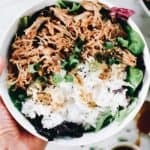 The Instant Pot is a real time and lifesaver for us. 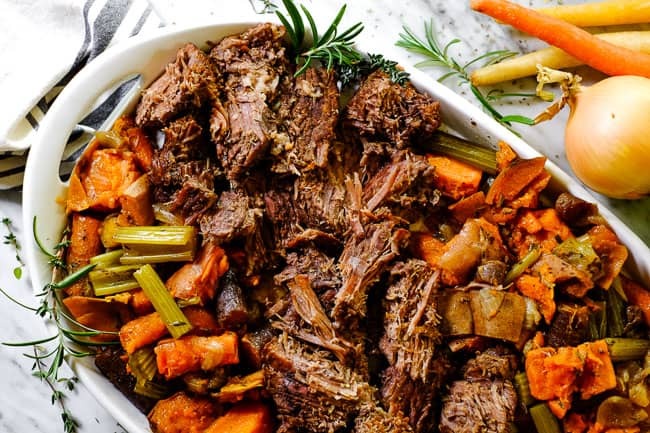 This Paleo + Whole30 Instant Pot pot roast (say that five times fast!) is a favorite of ours, especially once the weather turns chilly! It’s a hearty, cozy and healthy dinner the whole family will love! When we are making a roast in our Instant Pot, we like to sauté the beef first. Browning the meat first really locks the juices in and makes the roast much more tender once it is done cooking. 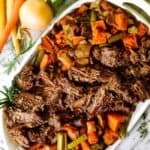 This Instant Pot pot roast is juicy, tender and it tastes like it took much longer to make. 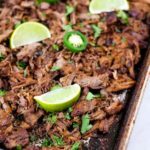 We typically make about a three pound roast, and sautéing for about 3-4 minutes per side does the trick for browning the meat, and then actual cooking time in the Instant Pot for that size of roast is 60 minutes. There are some tips for cooking larger roasts in the recipe card below. 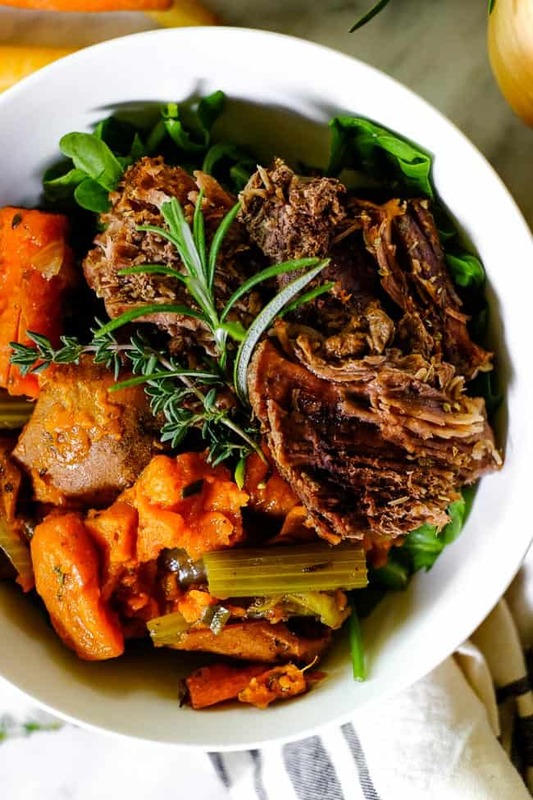 This Instant Pot pot roast recipe calls for sweet potato, but you have some alternate options. You can do white or orange sweet potatoes (you could even do white potatoes if you eat them), and you can also use your favorite winter squash if you avoid potatoes. I don’t digest potatoes well, so we have made this Instant Pot pot roast with butternut and delicata squash in the past and it works just as well. 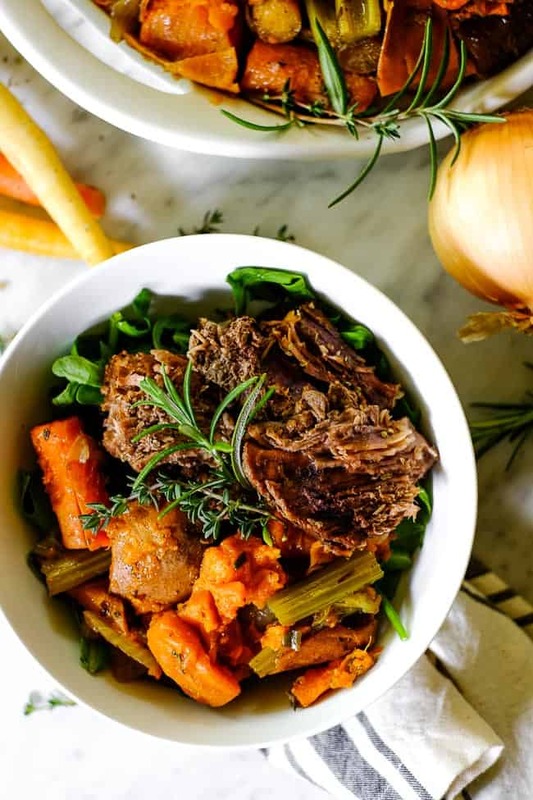 Fresh rosemary and thyme are optional ingredients in this Instant Pot pot roast recipe, and we highly recommend them! Fresh herbs are a total game changer for flavor enhancement, and if you don’t already cook with them, definitely give it a try! Rosemary and thyme are a couple of our favorites, and we are also often using fresh oregano and basil as well. What are your favorites? 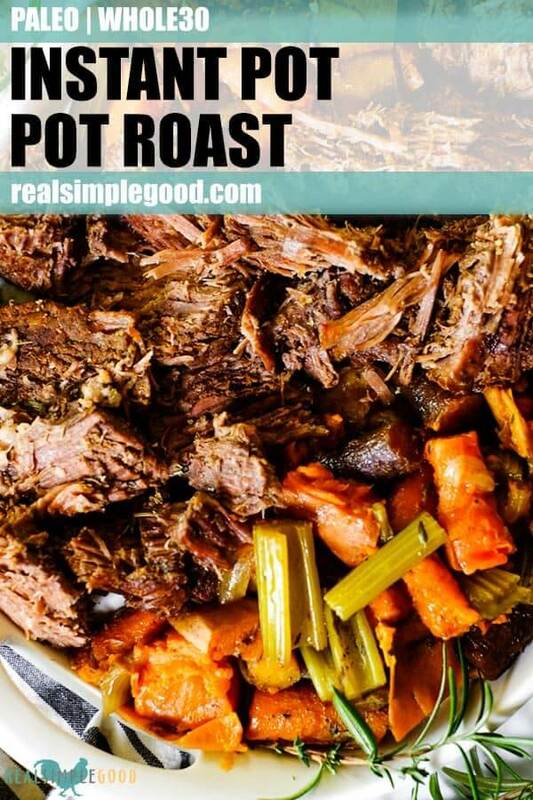 Time to pull out your Instant Pot and make this Instant Pot pot roast. It’s a great large dinner to make Sunday night and then have the leftovers in the fridge for easy re-heating during the busy work week! Leave a comment below to let us know how it goes. Also, take a pic to share on Instagram! Tag us @realsimplegood, and give us a follow if you don’t already. We’d love to stay connected! 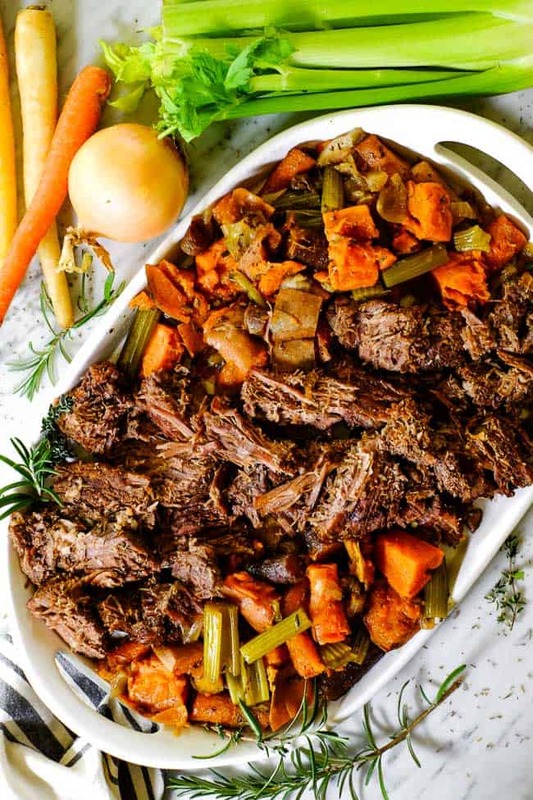 This Paleo + Whole30 Instant Pot pot roast is a favorite of ours, especially once the weather turns chilly! 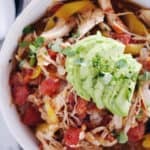 It's a hearty, cozy and healthy dinner! Make the seasoning mix by mixing all the ingredients in a small bowl. Generously season the roast on all sides. If you have leftover seasoning, add to top of veggies in Step 3 below. Prep potato, onion, celery, carrots and fresh herbs as noted. Press the sauté button on the Instant Pot and add ghee. Once hot, add in roast and brown on all sides (3-4 minutes per side). Press "cancel" button on Instant Pot once beef is browned. Pour in beef broth. Place potatoes, onion, celery and carrots over the top of the roast. Add in fresh herbs (optional) and any leftover seasoning. Secure the lid on the Instant Pot and close the pressure valve. Press "manual" button (or "pressure cook" button) and set the time for 60 minutes at high pressure. Once the time is up, let the pressure naturally release for 10 minutes and then carefully manually release the remaining pressure. Remove the veggies from the pot with a slotted spoon. 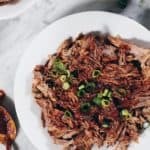 Shred beef in the Instant Pot with 2 forks. Serve beef with veggies and spoon some sauce from the pot over the meat when serving. Cooking time will vary for a larger roast. We did a 3 pound roast and 60 minutes was perfect. For a 4 pound roast cook for 70 minutes and for a 5 pound roast cook for 80 minutes. DELICIOUS!!! Soupy Pot Roast has been my favorite home cooked meal since childhood. This was spot on…just like mom’s!!!! 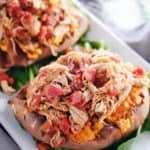 Do you peel and cube the sweet potato? We didn’t peel it we just cubed it. Question! Do I have to thaw out the beef roast first? or can I make it frozen?? Thanks! You have the thaw the roast first for this recipe. We made this tonight…the BEST pot roast I’ve ever had and I’m 24. Will definitely be making this again and again!! That’s amazing! We’re so glad to hear you enjoyed it! 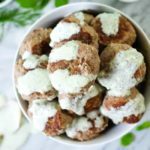 Thanks for giving our recipe a try! 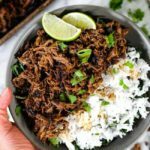 Hi there – the instant pot can take up to 20 minutes to pressurize and it also takes time to shred the beef. These are included to the cooking time to give you a true picture of how long this will actually take to get this recipe on the table. If needed you can let the pressure naturally release for longer. 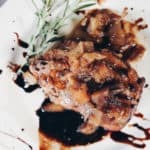 Hi I want to try this recipe tonight. 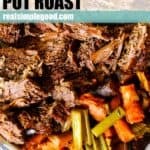 How long would I cook a 2 lb pot roast? Do I need to decrease the time? For a 2 lb roast you should cook it for 50 minutes with a 10 minute natural release. 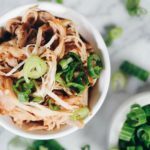 You can try cutting the roast up into 2-3 smaller chunks before putting it in the instant pot. I made this last night exactly as written and my veggies were complete mush. The flavors were great. Wondering what I did wrong to make the veggie turn to liquid?? Next time you could try cutting your vegetables into larger chunks. That will help them cook more evenly with the roast. I’m out of beef stock. Can I use chicken? Or just Water? Yes, chicken stock would work fine.